Laika, along with Aardman, is at the forefront of stop motion animation. With an array of visual delights such as Paranormal, The Boxtrolls and the brilliant Kubo and the Two Strings, they always deliver quality entertainment while being completely unique in its stories. Their latest, Missing Link, is no exception. Sir Lionel Frost is an explorer who is desperate to be recognised by his peers for finding monsters. Accepting a bet to travel to America, he must find and prove the existence of the sasquatch, or the Missing Link. What he finds is an almost intelligent creature who longs to find his own ancestors, and so the adventurer decides to head to Shangri-la to track down the Yeti. All the while being followed by the men who want him to lose his bet. Written and directed by Brit Chris Butler, who co-directed Paranormal, this is not only visually stunning but a hilarious romp. Where previous Laika films have children as their main characters, this is the first time adults take the lead and, of course, Big Foot. Yet this creature, while speaking and acting almost human, has an air of innocence that propels the humour along nicely. Mr Link, as Sir Lionel calls him before we find out the name he would prefer (no hints here) has more than a passing resemblance to something that Aardman would produce, as well as some of the more surreal humour the film possesses. Where the other films from the company also deal with darker issues, this is much more light-weight and fun. Not saying the previous movies are humourless, they do come at you like creepy fairy tales. This is bright and breezy and zips along nicely. The animations, as always, is perfect with each character etched out clearly and being supported by a strong voice cast. The production designs, as Lionel and Link head across the world from the Wild West to the jungles of India to Shangri-La, are beautifully realised. Yet its the relationship between the stiff-upper-lipped Lionel and the child-like Link that carries the film along. A double act, brimming with childish humour. The film could not fail with the voice cast, each perfect in their roles. Hugh Jackman fits Sir Lionel like a glove mixing smoothness with an air of arrogance. As Link Zack Galifianakis is excellent with perfect comic timing and a gentleness that makes him instantly likeable. 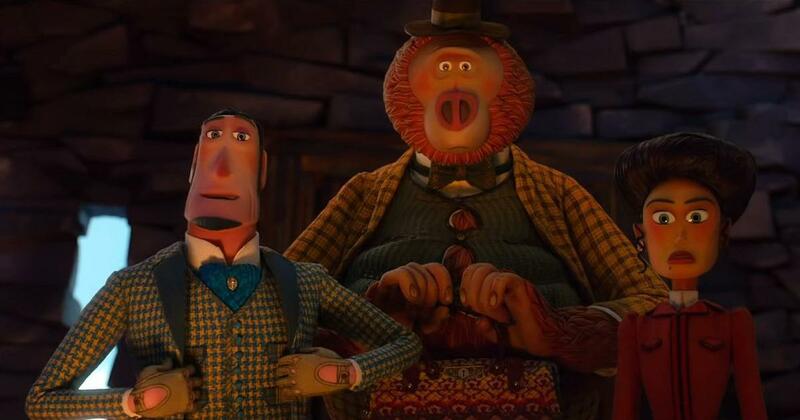 Missing Link is a bright, charming animated comedy that might not find an audience. Not because it’s a bad film. On the contrary, this is a real gem. With superheroes and Disney films abound, it might slip under the radar. Try not to ignore it. You won’t be disappointed.